The Community Investment Program was introduced in 2004 with the goal of promoting and supporting local businesses by encouraging both business and consumers to “think local first.” This gift certificate program has been recently reintroduced as “Local Loot”. 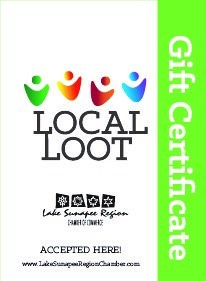 Local Loot is a gift certificate that can be purchased at the Lake Sunapee Region Chamber of Commerce office in New London, and can be redeemed at most local chamber member businesses. Look for the Local Loot logo in participating stores and businesses. How do chamber members get reimbursed? Just bring the gift certificate to the Chamber office and you will receive 100% of the value of the certificate. It is that easy. This “Think Local First” program provides a great opportunity for business owners to promote their businesses through the chamber, with no added expense to them. The more dollars spent at local businesses, the more these dollars remain in the community, building a stronger community.